Have you ever crashed your bike on a ride? Those who have know that even a small wipeout can cause some serious injuries. However, how many of us always carry First Aid gear? The number is surprisingly low. One of the most commonly overlooked pieces of riding equipment, and it’s designed to keep you from further injury and…..alive. The ADV Kit by RideWild Medical is specifically designed for off-road motorcycle adventures. It was created by a Wilderness-EMT and motocross track medic, who has experienced travelling on a motorcycle on the Panamerican highway. On one of his travels, he witnessed a rider go down on an adventure ride who torqued his knee pretty badly. 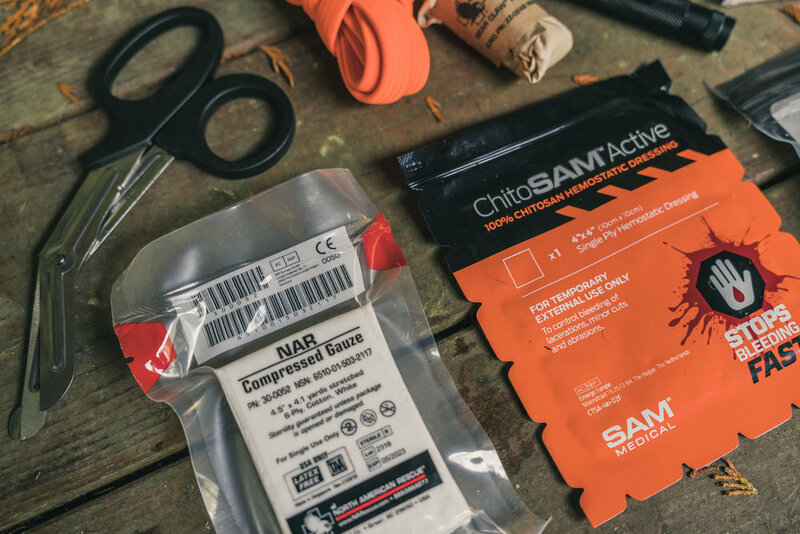 No one had the right kind of medical gear to deal with a situation, since most First Aid kits treat injuries from safer activities such as hiking. The setup of this kit is very impressive, and even comes in a very durable and waterproof rolltop bag. Each individual item is high quality, and even includes things like a splint and flashlight! Use of many of these items can be found online, such as the triangular bandage and steri-strips for wound closure. SAM splint, Triangular bandages, Trauma shears, Durapore tape, Safety pins, ChitoSAM 4x4 hemostatic gauze, NAR compressed gauze, RATS tourniquet, Bear Claw nitrile gloves, BandAids, Benzoin adhesive, 1/8" Steri-strips, Moleskin, Coast G19 flashlight, Triple antibiotic ointment, Burn gel, Ibuprofen, Acetaminophen, Aspirin, Diphenhydramine, and Precision tweezers. We recommend keeping a kit like this somewhere you can quickly access it, like the Nomad tank bag seen above. Also, when riding in a group, it’s good to let everyone know you have a medical kit and where it is located. “Good training trumps good gear any day” - Aaron Kinn, the owner of RideWild Medical, recommending everyone takes a Wilderness First Aid level training class.